Our summer heat continues apace, folks. At least here in Ottawa. So tank tops and white jeans, sandals and light dresses are still de rigueur. I don’t think I’ve worn a light jacket, even in the evenings, for weeks and weeks. And while I’m struggling to survive the heat, I’m dreaming of the cool. Sigh. Conjuring images of autumn in my head. Partly because I’m not much of a hot weather person. But also because I’ve been doing my fall shopping research in time for the Nordstrom Anniversary Sale. On the days when it’s too darned hot to cycle, or too humid and buggy to walk the trail, I’m on my exercise bike, trolling the web on my i-pad for fall clothes. Here are a few of the images that inspire me this season… well, actually, to be precise, they’re inspiring me to plan for next season. Like this polished look from Berlin designer Marina Hoermanseder. It’s from her Spring 2016 line… but I’d love a softly draped pair of pants like these for fall. My friend Liz says that burgundy is big again this year. I love this coat from the Marina Hoermanseder fall line. You can see her entire fall “Look Book” here, if you’re so inclined. I love lots of her pieces… just not sure about the pink plastic breastplate in some of the shots. Might be a titch hot. See what you think. I’m finding lots of camel in my virtual travels. And black with camel. I love this timeless look below. I can’t tell if the model is wearing a skirt or culottes. But who cares, really. This outfit is polished enough for work, if you have to go to work. And yet casual enough for my non-working life. I’m keeping my eye out for soft, loose sweaters like this camel one. Sweaters that are loose enough to wear on their own (aka not too clingy or form-fitting) and yet light enough to slide under a blazer. 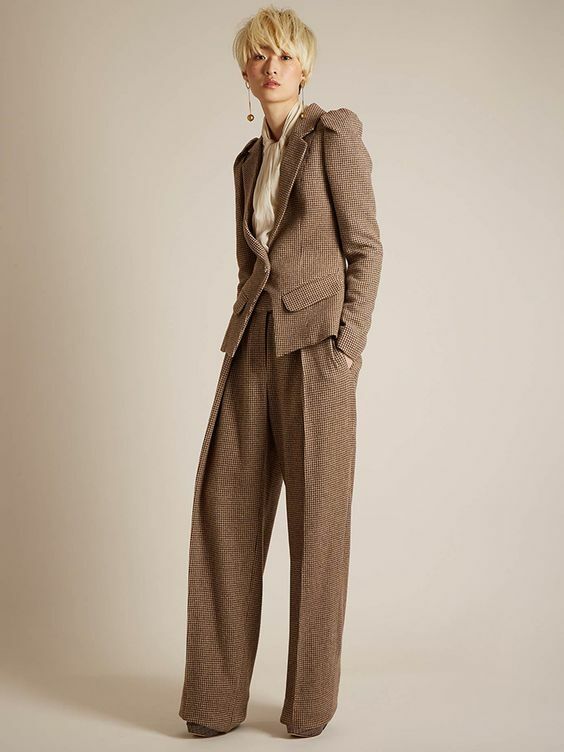 And I love this gorgeous Thornton Bregazzi suit below with the silky Alexander McQueen tie blouse from the Matches Fashion website. The model is Los Angeles based blogger and stylist Jayne Min. Matches Fashion featured her in a story for their “Influencers Edit” series where Min picks her favourite pieces for fall. Honestly, I now rely more on sites like this to inspire me than I do hard copy magazines. 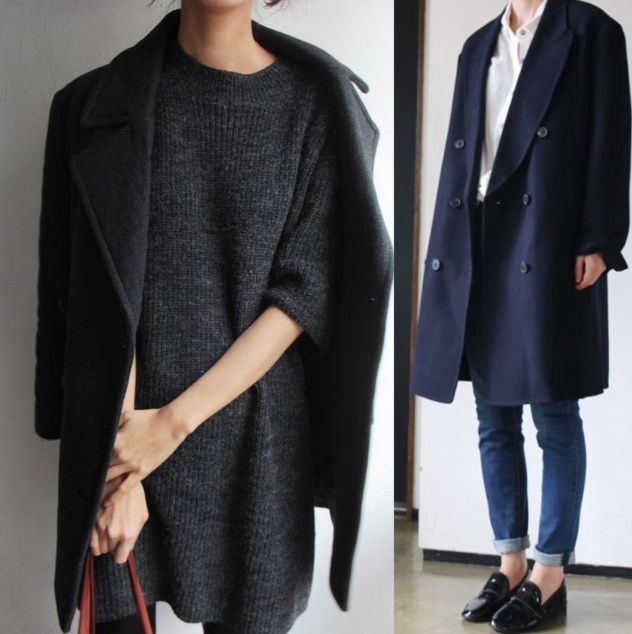 These casual coats look great with sweaters and jeans. I may be on the look out for a new coat this year. Navy or grey…or tweed. These are lovely. And I will need some new basics. So in addition to light sweaters, I’m looking for white tees and a white shirt. And I’d love to find a pair of cropped pants that aren’t jeans. So earlier this week, suitably inspired, having inventoried my closet, researched and made a general kind of list, I headed off to visit with Liz at Nordstrom. We were “shopping Anniversary” as she said. Looking exclusively at the items that were marked down for the Anniversary Sale to see what might fit with my “needs list.” Or what might strike my fancy.This was not necessarily my fall shop. Here were some of the contenders. I have to tell you that the pieces from the various lines chosen to be featured in the sale did not hold much appeal for me this year. I was disappointed; last year there were so many wonderful choices. Many of the items listed as part of the Anniversary Sale on the Nordstrom.com website were not available in Canadian stores. Or at least not available in the Ottawa store. Pooh. What’s up with that, do you think? Still, I didn’t come home entirely empty-handed. I bought a lovely tote bag. And a couple of other things which were sadly not on sale. And which I stashed in my closet right away. They’ll be “seasoning” there for a few weeks before they make an appearance on the blog. 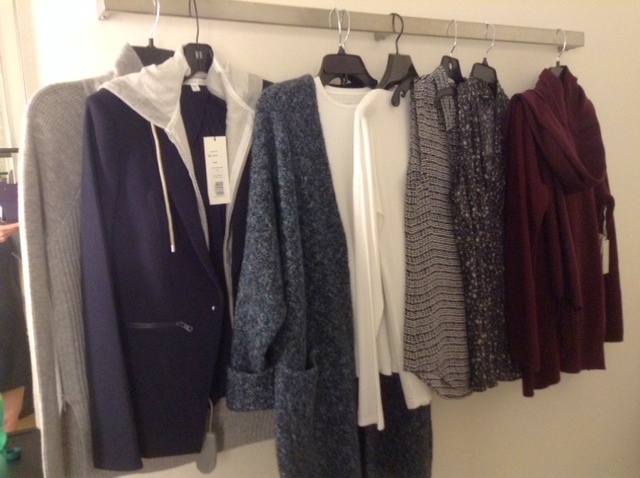 And… News Flash… I discovered a new designer whose line Nordstrom in Ottawa has recently started carrying. Veronica Beard. Have you heard of her? Liz and I both really like her clothes. I checked out the brand website when I came home, and the designer is not a “her” but a “them.” Two Veronicas, sisters-in-law. In their own words, they are trying to “strike a balance between classic and cool.” Designing “iconic staples” which are “effortless and chic.” Ok-ay. They are definitely speaking my language. And more important than the descriptors, I found the jackets well tailored, long enough in the sleeves, and comfortable. And the pants. Well… the pants fit me like a glove. Except… they’re pants. Ha. Here are two looks from the Veronica Beard website that I love. So I’ll be adding Veronica Beard to my short list of go-to designers. Those brands that fit my style and my lifestyle. And my body…. let’s not forget that little deal breaker. Because there’s nothing worse than loving a pair of pants or a jacket when they don’t love you back. Unrequited fashion love. I’ve known a lot of that in my time. And I suspect you have too. All of the looks in this post can be found on my Pinterest fall fashion board which you can check out here if you’re interested. I’d show you the things I bought, but like I said, they’re seasoning in my closet. Waiting until it’s a bit closer to fall. When it’s not sooo hot. Me and Ella… we both think it’s too darned hot. Right now, as I wrap up this post, I’m sipping a glass of cold white wine and waiting for Hubby to bring supper in from the barbeque. Blogging can be hot work, people. I’m going to try to put fall shopping out of my mind now for at least a month. Maybe. What are you up to? Not fall shopping, I imagine. Linking up this week with these great blogs: Visible Monday at Not Dead Yet Style, #IwillwearwhatIlike at Not Dressed as Lamb, Thursday Favourite Things at Katherine’s Corner, Passion 4 Fashion at Rachel the Hat, and Friday Finds at Forage Fashion, Style Me Wednesday at Shopping My Closet. Here in the states, a lot of items sold out really quickly. I have a Nordstrom card, so I was able to have early access, but by the time I decided to take the plunge, most of the items I had in mind sold out – at the stores and on line as well. I was a little disappointed as well. I love the look of camel and black and/or navy, but camel look terrible on me!!!! Much of the stuff on the Nordstrom Anniversary Sale website was not available in Canada at all. I hope that they are not going to go the way of Target who opened stores in Canada to great fanfare. People were excited to buy some of the new celebrity endorsed clothing lines, but stores in Canada never carried any of them. And to us Target became just another store that sold cheap stuff. The items that I saw at the Anniversary Sale looked second run to me. Not up to what they offered last year. But I did, just today, dream of rain. So, xox. Do you ever shop at Clothes, on Wellington? I love Muriel Dombret's designs. You're right, of course. I know it doesn't have the toggle closure… or a hood. And it's not a pea jacket either. I was thinking of the length of the coats, their casual feel… maybe car coat would have been a better word. Do they even use that term anymore. Yes, I do. I've had a couple of her jackets over the years. There are several other independent stores on Wellington and Richmond Road, as well. I've been thinking of doing a post on some of these independent stores. Still thinking of it actually. Just popped back to say that I've been researching coat "names." Learned all kinds of things. Including the term "Balmacaan coat." Blog and learn, eh? Hi Sue …sorry it's been a while! I really identify with your comment about "unrequited fashion love" I've had more than my fair share of that over the years! When items definitely look better on the hanger!You've shown some very appealing outfits here ..love soft fluid jumpers especially black and camel together. I've a black and camel striped winter dress that I often receive compliments when wearing. Interestingly I wear dresses much more in cooler weather …like to style them with boots of varying styles. Hope your weeks going well. I'll email you soon and comment on your "Bored" post …so much like my childhood. I really enjoyed reading it. p's thanks for the info on some new designers. I was very happy to discover Veronica Beard clothes… so much of what I see in stores doesn't suit my taste or my body type. I tried a grey and black turtleneck mini-dress/tunic at the Nordstrom sale but then I'd have to buy boots to go with it…so I resisted. *Nordstrom. Missed that my phone changed it! Hope your trip has been wonderful. You must be coming down to the last week or so. It has thanks! Starting our last week tomorrow…its crazy just how quickly it passed.I'll email you when I'm home if not before. I probably shouldn't say this 🙂 but the black and grey mini dress/tunic sounds interesting! I imagine you really suited it! I hear you. And if it weren't for the Nordstrom sale I wouldn't even be thinking about fall until the end of August. Maybe that's partly why nothing I saw really interested me… I'm not in the sweater shopping mood yet. I'm always so impressed by your disciplined approach to wardrobe planning, but I just can't think about fall shopping now. All my cool-weather clothes are in storage waiting for our next move, and then I'll be travelling for a few months, so this fall and winter, dressing will be a bit haphazard. Ah well! Buying ahead doesn't seem to work out well for me anyway. Today I discovered that the slip part of a dress I'd bought at Aritzia five or six weeks ago in anticipation of summer heat and never had occasion to wear until now is an XXS — The dress is a Small, my size, and somehow, even though I tried both dress and slip on in the change room and in no way had chosen an XXS for the slip, that's what I could not get on my body today. Panic ensued, in fact, as I had it halfway on and then couldn't figure out how to get out of it. Of course I paid full price, and of course the summer sale has been on long enough that there won't be any left even if I can talk some SA into letting me do an exchange without a sales receipt. . . . So frustrating as it was the perfect floaty silk outer layer and the lightest cotton lawn slip. . . .
That sounds like a disaster, Frances. So disappointing. I wonder if the store will give you a credit and you can order it on-line? Probably too late for that as well. Hubby and I just watched the final episode of Endeavour tonight…we had it saved on our PVR and Stu has been away fishing. I know you watch that series. So…what the heck happened at the end? Do you know why Thursday's daughter left??? We were both stumped. I am looking for a tote bag and would like to know what you purchased. It would be interesting to see your selection before the anniversary sale ends. Mary, the tote I purchased is from a brand called "AllSaints." Minimalist in design, with lovely buttery leather. The picture on the Nordstrom website doesn't do it justice. Here's the link to the page. Thanks, Erica. I'll check them out. That green suit is AMAZING! Can't wait for fall! Thanks Patti. It's fun finding a brand that I like and which suits my body. So far anyway.